What Is UM/UIM Insurance Coverage? You may have never heard about it, or if you have, you may really not know what it is. Uninsured Motorist (often referred to as UM/UIM) insurance coverage is a type of coverage that is available on your Washington automobile insurance policy. If you decide to purchase it, UM/UIM coverage can compensate you for damages that have been caused by an uninsured or underinsured motorist. A related type of coverage is Underinsured Motorist (UIM) coverage. UIM is designed to pay you for damages caused by another motorist who may not have enough insurance to fully compensate you for all of your damages. UIM is considered “floating coverage.” That is, this type of coverage floats on top of the other motorists insurance to provide you an additional layer of coverage if it is needed. Dollar for dollar, UM or UIM coverage is the best deal money can buy. Usually the cost of this coverage is considerably lower than the standard liability coverage (the type of coverage you buy to pay for damages that you cause another). But I see many people who try to save money by refusing UM/UIM on their policy. This is a big mistake. Can You Give Me An Example Of UM/UIM Coverage? Let me tell you about a true story. About a year ago, a woman called me about a car accident she had several months earlier (I’ll call her Janet). Janet was rear-ended by another motorist who was uninsured. The other driver was 25 years old, job-less, and had neglected to buy any insurance on his 1990 Honda. The collision was fairly significant, causing more than $8,000 damage to Janet’s Ford Taurus. Janet received a significant neck injury that ultimately required surgery to repair the herniated disc in her cervical spine. She had complications following surgery and another procedure was performed. When she contacted me, Janet’s medical bills were more than $80,000. And they were continuing to accrue because she was still getting treatment and medication for her ongoing symptoms. Fortunately Janet had health insurance through her employer. But her health insurance carrier only paid about 70% of her bills. What was more unfortunate however, was that five (5) years earlier Janet decided to reject UM/UIM coverage so she could save an extra $100 per year. That decision proved tragic. Janet’s decision to reject UM/UIM meant that she really had no recourse against the other driver. Oh sure, she could have sued him. But he was practically judgment-proof. He had no insurance and no assets. She never would have been able to collect anything from that young man. How Could UM/UIM Coverage Have Saved Janet? Had she had adequate UM/UIM coverage, Janet could have secured compensation from her own auto insurance carrier. But she had rejected the coverage years ago and never thought to renew it after her financial position improved. In the end, Janet had to pay more than $20,000 for the past medical care she received for her injuries. Janet had to pay a lot of money for an accident that she never caused. An unjust result to say the least. My advice to everyone is this: purchase as much UM/UIM coverage that you can afford. 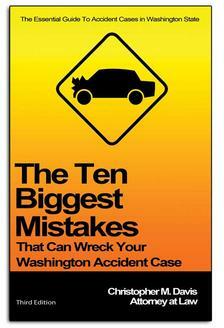 The accidents are often caused by uninsured or underinsured motorists. You never know when you could be the next accident victim. UM/UIM coverage must be offered by your carrier. Your rejection of UM/UIM must also be in writing to be valid. If you or someone you know has any questions about insurance coverage following an accident, or what type of claim may be allowed, please call the Davis Law Group for a free consultation at 206-727-4000. ?How Much Is My Car Accident Case Worth? ?What if the At-Fault Driver Won’t Respond to the Insurance Company? ?What if my accident was caused by someone experiencing a sudden medical condition?